This post’s intro is mainly text, so stick with the text walls and you’ll soon be learning how to use one of the most powerful link networks (if not the most powerful) on earth. To start things off, I’ll briefly explain what SAPE is and how people use it before we get into actually using the site. For those who aren’t familiar with the platform, SAPE is a Russian link network that allows you to essentially purchase ridiculously authoritative, aged links at a very small monthly cost, and as you can imagine this can produce some fantastic ranking results and can quickly become an incredibly profitable asset to your business. The way it works is that webmasters, hosts, hackers and pretty much anyone with access to aged websites will add link injection scripts to their site which will then add the site to the SAPE network. Where you can buy access to these links, no they aren’t contextual, and no… They definitely aren’t white hat. The advantages of SAPE stretch further than the fact that there are hundreds of thousands of high authority backlinks at your disposal, as in the process of purchasing these links you’re leaving virtually no footprint behind. Not only that, SAPE’s sheer extent of available links (A network with over 700,000 sites!) gives users the ability to filter the search to specify the links niche, URL extension, PageRank, number of backlinks on that page, you get the idea. The list goes on and on, and the best to way to get good links with SAPE is the filtering process, which I’ll cover later on in this post. So now that we have an idea of what SAPE is and the power it holds, let’s get in to actually using the site. 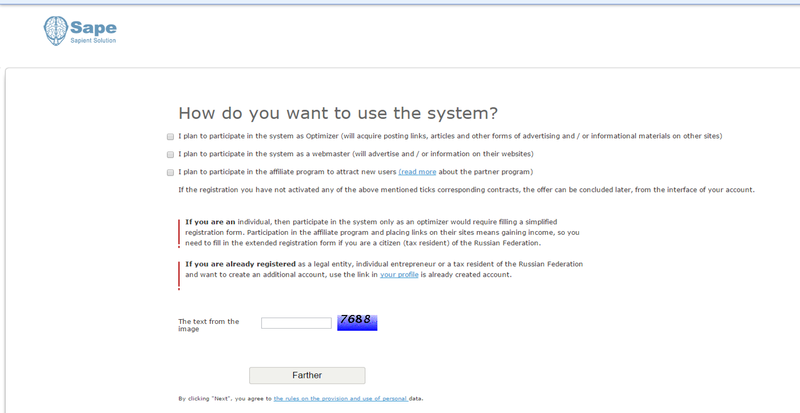 As I mentioned previously, SAPE is a Russian network, so unless you understand how to read Cyrillic Russian you’ll have a difficult time navigating the site. Not to worry though, this is where the Google Translate extension comes in handy. The Google Translate extension pretty much does what it says on the tin and allows you to translate each page into clear English, which is an absolute lifesaver when using SAPE. Yes it’s a little bit frustrating at first having to translate every single page when using SAPE, but you do get used to it in time. To download the plug in, firstly make sure you are using the Google Chrome browser, and then simply head over to google and search “Google Translate Plug In”. The one you want to download is the one that appears top. The plugin will then be added to the sidebar, and it’s ready to use for SAPE. Now you’re ready to head over to sape.ru. Once you’re there, click on your new Google Translate plugin icon in the top right hand corner and press’ translate this page’. The page should then read in clear English. The next step is to set yourself up with a SAPE account. It’s completely free to register but you will have to deposit some money into your account in order to purchase links (I will run through how to do this later in the guide). For now though, hit ‘register’ at the top right hand side of the screen and then translate the next page that appears. When this screen appears, make sure to select ‘I plan to participate in the system as Optimizer’ as this will allow you to purchase links from the site. Once that’s done just fill out the captcha at the bottom and select ‘farther’ (yep, sometimes the translations are great). You’ll then be taken through to a new page. Again, just translate each page by selecting the Google Translate icon and press ‘translate this page’. After that you’ll notice a big section for your passport details. 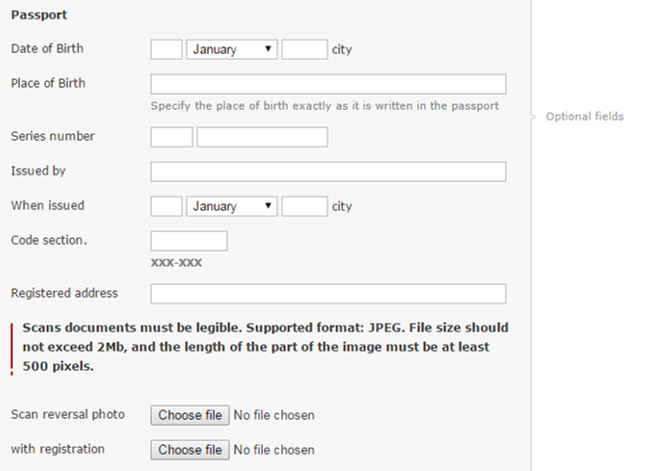 Don’t worry about any of this as this is an optional field, so leave all of that section blank and hit next. Once you get that, head over to your email and you should have received an email from SAPE. Some of you that haven’t used SAPE for a while or have previously used it may note that the homepage looks a little different. That’s because SAPE changed the design this month… Finally. So now that we actually have a verified account with SAPE, the next step is to add your billing information to the site. As I touched on early in the post, the links you purchase from SAPE cost a very small monthly fee to be put on the sites of your choice, and this monthly fee is taken out of a deposit that you set up before purchasing the links. As a result of this, it’s required that you set up your payment method and deposit a small amount of money before actually getting into the process of using SAPE for link purchasing. Before I show you how to do this, it’s worth me mentioning that due to SAPE being a Russian network its currency is measured in Rubles, so don’t be too worried if you decide to deposit 4200 rubles into your account, as in actual fact 4200 rubles is about $45… Choosing how much you decide to deposit at the start is entirely up to you, however as it will likely be some of your first times using SAPE, I recommend just dropping the rubles equivalent of around $50 into the account at first, and then as you start to see the benefits of the links that you purchase you can increase your balance as much as you’d like over time. You can easily find the exchange rate of rubles to dollars by doing a simple google search, “30 rubles in dollars” should do the trick. Now that that’s all explained, let’s get into how to go about connecting your payment details to SAPE. So the first thing you want to do for this step, once you’re signed in to the SAPE homepage and translated the page, is to scroll down and you should see a link that says ‘Optimiser’. Click through to that and it’ll take you through to the optimiser page. When you’re there, you’ll notice a red alert box that reads: “Your optimizatorskih account is not enough money, you can not buy links in manual and automatic mode. Recharge balance or activate the settings that allow waste to Webmaster account.” What you want to do is click the ‘Recharge Balance’ link on this alert box. As you can see, there’s a list of the various payment methods that you can choose from. I advise using the credit card method as you’ll find that some of the others are not always available for certain countries, however this is entirely up to you. Once you’ve entered in the amount you’d like to add, click ‘create request’, followed by ‘confirmed’. 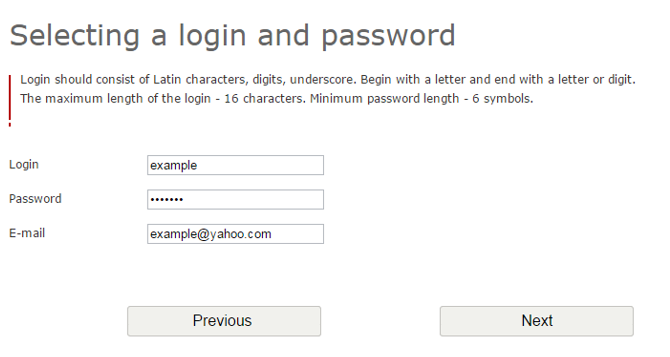 That will then direct you to this page where you enter in your bank credentials. This area is fairly self-explanatory, however it does give you the option in a tick box to enable payment notifications which is completely up to you. Once you’ve entered in all your details, press ‘proceed’ and then you should be taken through to a page to confirm your deposit. One thing I will say when setting up this process is that SAPE can be a bit temperamental in terms of confirming your card. 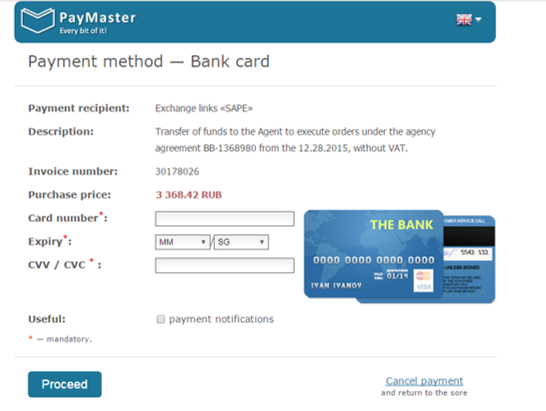 When I first connected my payment method to SAPE, it wouldn’t accept the card due to a certain type of error. Don’t panic if this happens though, as a simple 5 minute phone call with my bank quickly rectified the problem, and I then tried again to make a deposit on SAPE and it worked fine. If for whatever reason it fails to work after , your other option is to contact SAPE themselves by going to the home page of their website and selecting ‘feedback’, then ‘references’, then ‘bank card’. You’d then need to send them a quick message (translated into Russian using google translate) to just explain the situation, however the phone call to your bank should fix it 99% of the time anyway – Western banks, unsurprisingly, find it a bit odd to suddenly be buying rubles from a Russian provider. So assuming all has gone to plan, you’ll have now successfully deposited your chosen amount of money into SAPE. Now it’s time to set up a project. The project or projects that you create are essentially based around the links you want to build to, so for example if you had recently built out 3 parasites that you want to buy SAPE links for, each parasite will have its own unique project. These projects are super easy to set up, and are key to the organisation of your SAPE link building campaigns. So the first thing you want to do is head back to the SAPE homepage, and once you’re there scroll down and click on the ‘optimizer’ tab again. When you’re there, scroll down and there will be a small section with a link that reads ‘create a new project’. Click on that link and it’ll take you through to the projects page. Where you essentially set the rules for the links that you purchase. This section is down to personal preference really, but I’ll show what I typically do for my projects. So as you can see in the screenshot, you’re able to set a limit for how many external links are on the page with yours, and when this limit is exceeded your link will automatically be removed from the site. This is a useful feature as say for example you find an insanely strong link with only 4 external links on that page, but during that week 10 additional external links are built onto that page, the link to your site will lose a significant amount of link juice from that page and may not be worth the monthly fee you’re paying for any longer. I’d probably recommend setting the external links limit to a maximum of 10-15, however this is completely up to you. Another filter that can be changed here is the ‘links to error’ filter. This refers to the fact that SAPE links will occasionally not work when first purchased, and as a result will show an error message. This filter enables the link to be automatically deleted after the error message stays for a certain amount of days. You can set the amount of days at anywhere from after 7 days to after 30 days, and I usually set mine to be automatically removed after 10. Once these settings are added you can leave every other setting as it was and hit ‘save’, your project should now be created. This page is where all your projects will be listed, and any changes you need making to the projects can be made here. For this next step, click through to the small cross just underneath the applications section on the right hand side. When you do that a small drop down list will appear, and when it does select ‘URL’. Once you’ve done this, press “add” and then you’ll be taken to the next page. Here, you add all of the anchor text that you want your links to appear as on the links you purchase. For SAPE links, I advise you use keywords that you’d like to rank your money pages with for your anchor texts, however I would suggest you acquire links from other sources with generic and naked URL anchor text in order to ensure link and anchor text diversity for your money page. Before you press add and move on to the next step, here’s a few options just above the add button that can be changed if you want to. The ‘maximum number of texts’ option basically means that if you set it to “5” any keyword from your list can not be used more than 5 times for a link. This feature can be handy for those who are building out loads of SAPE links to one project or don’t have an extensive list of keywords for a certain project, however in the past I’ve added a long list of keywords so it hasn’t been something I’ve had to change. Worth making a note about if you start to use SAPE more heavily in the future. So now we’re getting somewhere. We’ve fully set up the account, connected our payment method and deposited some money, and we’ve created our first project. Now let’s buy some damn links! Ok, so now for the fun stuff, that I actually find quite therapeutic… When it comes to finding super strong sites to get links from, SAPE is up there with the best. What surprised me the most when I first started using SAPE a few years back, was the ease of buying a link. Once you filter what kinds of links you’d like to look for, it’s literally a case of a few clicks and it’s done. Seems a bit daunting at first glance, but ironically this section is probably the easiest to understand when using SAPE, especially for the more advanced SEOs. So this section is basically where you filter the type of links you want for the site you’re building to. Some of these sections I’ll edit, some I’ll leave blank, again a lot of it comes down to personal preference in terms of what type of link or links you’d like to purchase. To give you a rough guideline as to what I do for this section, I usually set the PR Main from 3-6. This means that the home page of the site will have a Page Rank of anywhere from 3 to 6. If you’re looking for just home page links as opposed to inner page links, then you’re ok to leave the PR and SR boxes blank, however if you’d like to show results for inner pages within the site, it might be worth just changing the PR box to the metrics you’d like, also. I then change external links to somewhere between 1 and 10. The external links section just refers to how many external links are on that actual page. Projected number of inbound links is something I often leave blank, however there’s no harm in changing this to your liking if you feel it’s important to. The price per month section is measured in rubles, so as a result of this I often put the maximum at around 800, but you can go higher or lower depending on your budget (just to clarify, 800 rubles equates to just under $11 a month). Domain age I’ll usually change to 180 (which means the domains shown are older than 180 days) again if you feel like altering that to your preference, you can. Then in the ‘level domain’ section you are able to specify what kinds of pages are shown. In here, select ‘all levels’, but on the ‘nesting level page’ you are able to decide where you want the link to go. If you select ‘the main’, the link will be going on the home page which is the most powerful place for it to go, and if you select 2nd level or 3rd level then the link will be on a page 2 or 3 tiers deep, which is obviously not as powerful but these links are a lot cheaper to buy. Completely up to you but I’d always go with the homepage. Something important to do also is to make sure that ‘display sites placed links’ in the top right hand corner is unticked, as ticking that option will show sites without the URL, therefore making it impossible to see what the site is and check its metrics, link profiles and the site itself. You can have a play around with the other filters on the site if you’d like to but they’re the main settings you need to change. After that, leave the keywords section blank as we’ve already entered in our keywords when setting up the project, then just press the ‘find’ button at the bottom of the page to search for your potential links. You should then get a list of domains from which you’ve filtered. If not and a message appears saying ‘no playgrounds’, simply broaden your search and try again, sometimes making your search too specific can lead to no results being found. The process for me then is to load these sites into Majestic’s bulk checker or BHC’s bulk majestic checker to fully check the metrics. This can be a little bit hit and miss, but trust me, even with about 10 minutes of searching through these domains you’ll find some real gems. Once I’m really happy with the link and its monthly price, I’ll proceed to buy it. The “/” in the bottom left indicates that it is a home page link (if it said “/article” for example then it would be an inner page link). If you’re happy with where the link is placed on the site, click ‘select text’ in the bottom right and choose your anchor text from the list that appears. When you’ve done that, simply click the small tick box in the bottom right, and to purchase the link scroll down to the bottom of the page and click ‘Buy’ in the bottom right. You are able to buy links in bulk by selecting multiple links at one time. Once the link is bought, it should take approximately 1-2 hours to go live, sometimes it happens within a few minutes, sometimes slightly over 2 hours… I keep an Excel document managing all my links, and can easily run the links through ScrapeBox to check if they’re live. And that’s pretty much all there is to it. The rest of the process simply involves continuing to filter and find relevant, strong and cheap backlinks for your money pages/sites and getting them bought. As I’ve mentioned numerous times in this post, SAPE is amongst the most powerful link building tools available today, and is a perfect platform to help rank pages for some very competitive keywords, at a low price. If anyone says “but Google go after SAPE” I’ll refer them to this post by me from 2013. I hope you enjoyed this post, and have a great 2016. Drop your SAPE success stories, questions and what you’d like to see next in the comment section below.. and don’t forget to join my email newsletter for more updates. For the Filtering Process I also use Textmechanic to get a list of all domains and then check them in bulk for their metrics…. in Majestic. Nice tip 🙂 Thanks for the video too! This makes me wish I hadn’t sold my affiliate sites…great post will use this on a new project. Excellent guide. I tried SAPE few months back and got decent results. Will surely try this again. I have a question, many of my links usually go under “wait” menu and never goes live, even after a week. Is there any way to make those links live? That’s what the settings for removing the links come into play.. Sometime’s it’s because the link injection scripts get removed, it can be a variety of reasons though. Normally they either won’t come back, or they will, but it’ll be at a really random time. Hey ray, would love to hear about your success story. Could give us some more deets on your ahrefs, majestic or sem rush analysis of the sites and also the niche you were going for? Also were you able to get any contextual posts? Hi, good post, thanks. Do you use some sort of a buffer between these links and your money sites? Sometimes, sometimes not 🙂 Depends on the types of ranking I am going for. You can use buffers like dofollow web 2.0s, PBN posts etc.. Really any dofollow, tier 1 link though contextuals seem to work better. Are you building links directly to your money site? Or maybe is this best to boost some tier 1’s? What’s your thoughts? So techniclaly this is illegal right? Its not even blackhat… its craphat… But I’ll admit that I did indulge throug ha broker couple of years ago for some clients that were ok with it. Until I found out what this “actually was”. And, i’ve not done this since. Although, one can very easily say that this is just like the top sites who openly put banner ads on sites like kickasstorrents which sort of positions the dilemma in a similar light?… as the advertising network + KAT + advertiser are essentially ripping off the movie and other digitial industries, through a backdoorish loophole… right? So, is that sort of similar with SAPe as you’re buying from an advertsiing network (SAPE) thats hacking into the sites… that can be argued to be similar to what KAT does with hollywood…. yeah? 90% of the sites on SAPE aren’t hacked.. They’re webmasters & hosts putting link injection scripts on, may be immoral but not illegal. SAPE doesn’t own any sites on their network, they’re submitted by outside owners, SAPE just take a fee. When you blast SAPE links to your money site how many links you mostly order in quantity homepage/inner pages, I know it’s vary from niche to niche and your needs, but I assume that around hundred links would be minimum for most niches to see results. Also do you blast these links on same day or you drip feed them? Does link velocity here matter? 100 is actually overkill. I’ve seen results for major KWs with 50 very powerful links. Drip feed them day by day normally, random pattern, no indexing services let it naturally index. Yes it definetely does. I normally do 1-3 per day. Is there any way to drip feed links automatically without logging into SAPe daily? Depends on the keywords you’re going after, what kinda money page you build etc.. I tend to go with PR3+ TF15+, but it’s always a good idea to check the link profiles when first starting out. Great post Charles. I’ve been thinking about purchasing SAPE links for some time and this guide gives me the motivation to just go do it! Appreciate the time you put into this article. Just want to point out that people should be careful pointing SAPE directly to moneysites that they would not want to lose. I did the mistake of doing this, and I’m 99% it was because of a SAPE link with the “this site may have been hacked” message in SERPS that I had two of my moneysites manually penalized. From now on I’ll only throw SAPE links towards huge authority parasite pages and through a buffer like a web 2.0. Yes, Part 2 can cover topics like how to best use SAPE links or may be even some info on SAPER as i have not seen any tutorial for it online. 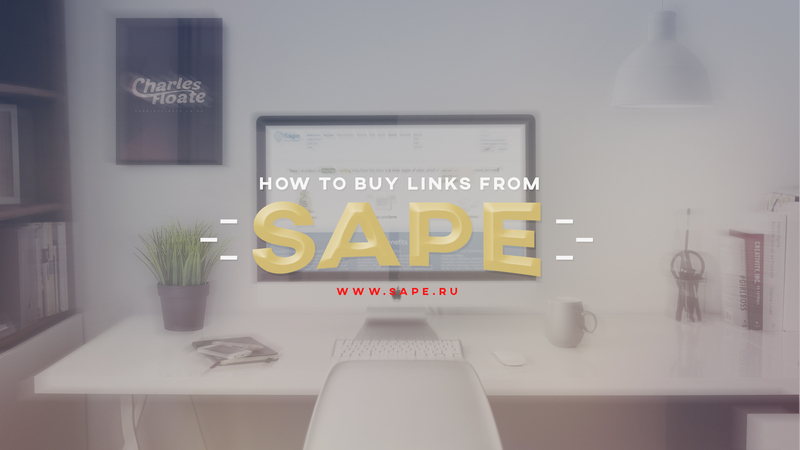 I have had a few challenges buying links from SAPE but I am really sure that this guide explains it all in simple terms. From a risk end Charles, where would you rank SAPE @Charles? Otherwise, such an amazing post. I will experiment with one churn and burn project to test for myself. Depends where you use the SAPE links, as to how risky it is.. Tier 1 on a brand new money site? Probably very risky. I guess SAPE is better than PBN Links on BHW. Btw, can you tell me which PBN service should I rely on? I’d suggest not buying links from BHW, they tend not to be the best. Interesting. Thoughts on sending sape links to long term authority money sites? Bad idea? P.S. You got into my spam comments section, maybe an email or IP blacklist? I’d look into that. So SAPE still works? Thank you for the tutorial, will try out on some of my niche sites. lol it was 1st day for me in SAPE so i don’t know what i actually did ..so what do you think ? 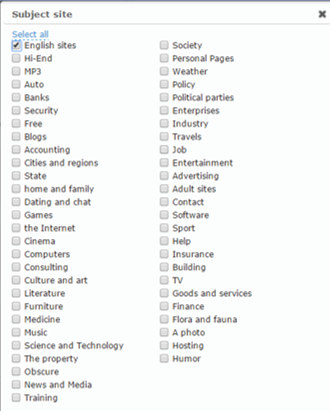 I don’t see the option of choosing .gov, .ac as the TLD in the above image. Can you clarify? 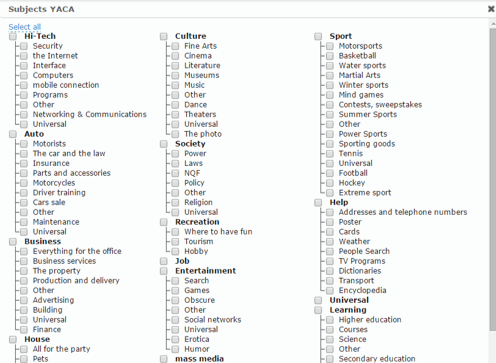 But Sorry, I still can’t see .gov in the TLD drop down. I can see .edu and other TLDs but not .gov. I want to do again a Churn and Burn test, buying a domain or something, like using it for parasite (even if the site would stay up in Google for just 1-2 weeks). How would you suggest for me to do that? Like how many links, in what period of time? Only main anchor text, etc? I heard that a few years ago some guys were buying SAPE links, a lot of them I think, after 1-2 weeks BOOM, site to the top, was staying there for 1-2 months, then they repeated what they did. I tried buying like 1 year ago around 40-50 SAPE links to my site (carefully chosen the links, high TF etc), but didn’t manage to rank my site. Thanks a lot my man, I apreciate it! I’d just go all out Stefan, blast the page with 100 high PR (4 – 8) SAPE links, run them through an indexing service and let it ride out until it’s deindexed. I wouldn’t use this on a fresh domain money site, go with this via a Parasite or an aged domain. Thanks a lot for the response man. Would you say look for high TF as well on those 100 high PR (4-8) SAPE links? Or just randomly choose 100 high PR and that’s it? I say go with TF10+, though link profile > metrics, as usual. Is there some on Fiverr or elsewhere I can hire… This is way out of my depth? Fiverr do offer these yes, but as they’re monthly rentals you’ll have to re-buy every 31 days. hi Charles thanks for this i wish i use sape but don’t how to do that but your article help me to join sape network. Hi Charles, just wanted to ask does sape accepts prepaid cards. Yes 🙂 I use them. Hey, Charles, thanks for this detailed good guide! I’m “fighting” with SAPE since many days, but I still have problems filtering and buying. Everytime I try to filter the sites, soon after I see on my projects a bunch of links already placed, and everytine all my credit balance go away. Even if I immediately delete them, I lose the money, so I’m charging $10 a time (and loosing $10 a time… 🙁 ). What about that software SAPER? There are no informations on forums, and his website has no “Contact me” button…..
Is it a trusted tool/seller? Yes, it’s a good tool 🙂 Bad support, but the tool can be used for easy filtering! Hey Charles, good guide as usual. I want to ask – is there any reason why you are using TF as a filtering metric instead of PA? Hey charle, still work sape link network as talk here? 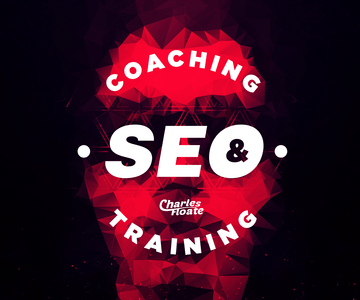 Thanks a lot Charles, your blog really helped me to learn exciting new things in SEO. Outstanding. But man is funding this thing turning out to be the next hurdle. Tried 5 cards, none of them worked. Even went and grabbed a prepaid Visa. I opened a case with Sape because my bank said the charge was never attempted. The good news is these hurdles keep out the people who give up when running into obstacles. Hopefully I will get this one cleared and I can get testing. Happened to me as well (PayPal Debit and my BofA bank card). I finally called PayPal and they unblocked Sape from their list. They have a ton of international companies blocked, until someone calls and complains. The only downside is there is a $250 USD transaction limit per month for PP. I also used the old “PayOnline” to map the card. It didn’t work. They had to add the card manually. Wow…this is a really great guide. I see a lot of SEO services selling SAPE link subscriptions for 100s of links. In fact, I am subscribed to one on one of my money sites and the service is doing really well with about 150 SAPE links across 5 urls. All primary keywords are on page 1. It got me thinking: how/where do they get access and well, I think you have pretty well spelled that out. Assuming these links are costing me about 40 to 50 cents, it also made me wonder how much the SEO service is paying. I don’t know that you could really answer this directly, but on average is there a typical price for a decent link we should be on the lookout for? Excellent post – I am going to give this a shot. I normally pay anywhere between $0.20 and $2 a month for a decent quality SAPE Link. The $3 and over links tend to have lower OBL and are better quality. Great guide, followed it the letter and got the ball rolling!, thanks man.Just one question, i dont know if its just me but my google chrome plug-in wont tranlsate any of the items in the dropdown between “Actions on selected”, and “Run”,on the live links page, im pretty sure one of those options is to remove a link as well in the future so it would be important to know,thanks in advance. First of all kudos to you man for such a wonderful post, only coz of this post I have started my SAPE journey. I would like to know that I have selected few of my backlinks with TF 20+ & I am spending about 40$ for 30 links with those metrics. Now my question is that I did increased the overall TF, CF, PA, DA of my website. Yes, my website moved a bit in SERP but still stuck onto 2nd page. I have left those backlinks who had TF <10 but had like thousands of backlinks having on those websites, I didn't chose them because of low TF, so was that wrong from my side ?? Also I have seen you have commented that you found 5TF website & you said it was good, then how do you judge if that link is good or not?? I would love to have chat with you man, I need to ask you alot of questions. $40 for 30 links is decent. My advise is to wait it out, how long have those links been live? It can take several weeks to see the full effect. Nothing’s wrong, it might just take some time.. Also the $40 for 30 links is fairly cheap, what TLDs did you select? Don’t judge by metrics, judge by the backlink profile. I offer consulting, click the “Hire Me” option on the homepage. Amazing post that for sure got me interested in trying SAPE out. I was going to use a PBN buffer for the SAPE links. About how many SAPE links should I send to each one of my PBNs and what metrics should I look out for those SAPE links? I’d say 3 – 5 HQ Links would be a good start. Can you tell me how i can buy SiteWide links using SAPE, i see some people buy links which gives links from all the pages of the sites but when ever i buy a link it get placed only one page. You can’t buy site wide links, they don’t allow it. Nice article has any one got improvements in ranking ? Hi Charles, great post! Quick question: Are there any .de links on sape? I want to try it in the german market. thanks a lot! After I chose the website types and TLD, SAPE loads over 2K sites. Now I would like to export them and analyze them via Majestic explorer. but there are no export options. Also is there any way import the chosen site back to SAPE once I am done with analysis. Thank you for the helpful tutorial. In regards to other black hat methods, I cover them in various blog posts and my course. Thanks a lot Charles for great tutorial on no body is talking about. I was really frustrated about the High TF weird links my competitor have. Then I researched and found that that are Sape links. Now I drooped couple of home page links (120+280 rubble per month) in last 1 weeks to my PBN which is a small niche site and will update the results. 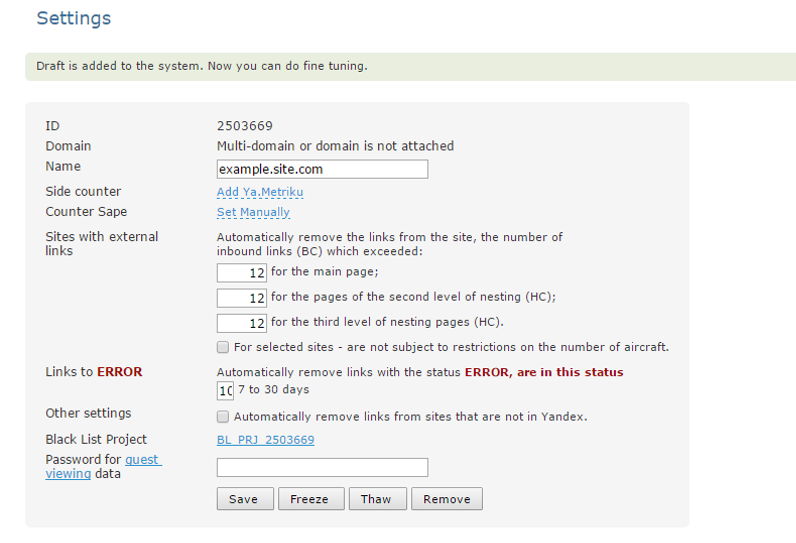 How to know the increased no of outbound links except manual checking in source code. I don’t wanna to remove them automatically. Are they shown on Project dashboard? Why they don’t have .com domains if I am not missing something ? No they aren’t, you can just check via a tool like ScrapeBox. They do have .com’s – You can filter by TLD or just go to the English-only category which has a lot of .com’s – Generally they are more expensive though. There is only one person that started selling SAPE links with TF. 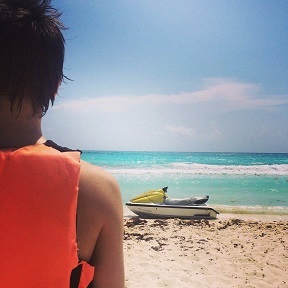 That was Daniyal. It worked then and it still works today. There is a filter you can select so you can see only .coms if that is your search criteria. or yes if your downloading a huge batch then of course use scrapebox. Charles, I think the layout is updated. If you can update this article with recent layout and option, It will be good. The layout has updated, this post will take a while to update for it, as it’s so big haha, but it’s still got the same search functions. I purchased my first 4 SAPE links today. You are right, I found some real gems, considering how powerful the linking domains are. Apart from this. I’m having a blast learning to use this new tool, thank you for sharing in this guide! Not too normal, but some advertisers don’t want super spammy anchors. Thanks for the guide. Do we need to wait until Google indexes parasite page before creating sape links? Also, do social signals help in any way for quick parasite-sape link ranking? Social signals tend to be ok, but I’ve never used a huge amount of them. I’ve created youtube video that was indexed and ranked on 65 position instantly for 1500 searches/month kw. Now when I threw 3 sape links at it the same day with 2 having TF>=50, I saw one of the links dissappear from SAPE AFTER it was put on there. This happened due to maybe site owner not allowing it after he saw it there (this is blackhat afterwards). But Google kicked my video from SERPs, at least I cant find it on top 100 now. Now, my question is, is sape link dissappearance and my video vanishing from serps related or Google is just playing with it to see how I react? And how to safeguard our parasite against such bad luck? Do we need to choose links with TF not very high to ensure we wont be spotted? Probably unrelated, because it’s a fresh video, it could of been put there straight away before Google properly place you. You’ll often get inflated rankings straight away where you rank higher, because Google hasn’t gone processed it properly yet. Safeguarding – 301s are always good, but 2 links isn’t much really. Metrics also don’t mean all that much, I prefer looking at the link profile itself. I do, but I don’t share it sorry. Very easy to make your own though, just format the live link, where it’s pointed to, the anchor, the price and the rebill date. Please give me a piece of advise, Charles, if you will. I run an e-shop (started in June 2016) of high-end goods in a very small country. After registering in all available online business registries I have only about 30 natural backlinks, and rank 10-20th on the most important keywords for local market in local language. I would like to power up my rankings with SAPE links without my website getting banned. What would be the best strategy? Build direct SAPE backlinks, or make a similar website with rewritten content hunting for same keywords as my money site? If direct SAPE links would work, how much would be safe to use? Don’t put any links direct.. but you can always power up your Tier 1 links. Hi Charles, Awesome post as always, thanks! I just do custom searches everytime, haven’t found a way to revisit and rebuy links yet, unfortunately. No worries, hopefully Sape offers this at some point… Thanks for getting back to me! Charles! Great guide btw but I need some help.. I’ve been trying to REMOVE a project out of my dashboard but I can’t seem to figure it out for the life for me. How can I do this?? You should have a drop down menu that allows you to delete it, I’m not too sure with the new UI to be honest Eddie as haven’t deleted one since they updated it about a month ago. So if I want to rank my money site am i better off pointing these sape links to my PBNs to power them up instead of directly pointing them to my money site? Nice article but i am a SAPE member since some years used it some times, i just wanted to ask you how is sape in 2016/2017 going? I was thinking to use it for my money site in the next days, i am sitting on #12 for 1 kw medium competion. I mostly use TF25+ sites with OBL <10 (i check OBL on scrapebox for better results than sape tool bar). Also i want to ask you if you know a very good diversity service ? which kind of links should i do for diversity? Thanks! I only use SAPE tier 2 now, especially for a money site. Fire it at guest posts and PBNs. Diversity I’d suggest a mixture of link types – Comments, Q&As, Forums, Citations etc.. Use the best providers for each, not one pack. I actually got referred to this post by SAPE customer support when I asked them a question. I wondered what your opinion is on homepage SAPE links vs Internal links? I’m seeing internal SAPE links with TF 25 on domains that only have TF 23, and the internal page has no backlinks. This leads me to believe that the TF has been manipulated somehow. Especially when I run the same url on ahrefs and if shows a low UR rating of 6 or whatever, and again, no backlinks. I’m thinking that homepage links are likely to be more reliable, even if they are more expensive. Also, most SAPE penalties appear to come from competitor complaints, so do you think that they can be used safely to money sites if they are 301’d through domains with bots blocked? I like a mixture of both.. I tend to just go page by page, and try and find as niche relevant as possible. They can, but I tend to use them as Tier 2 instead. So you support black hat techniques too? SAPE is a black hat link network…..